One of the first things that fascinated me about Ripley County when I started my job as Executive Director for Ripley County Tourism Bureau was that we had a popcorn farm in Sunman and I’d never heard of it. I mean, I LOVE popcorn. We’ve actually grown small patches of it in our garden. How could I have missed a major gourmet popcorn farm in the county? Riehle’s currently plants an average of about 200 acres of gourmet popcorn each year. All the planting, harvesting, cleaning, packaging, and shipping are done right from their family owned and operated farm in southeastern Indiana. 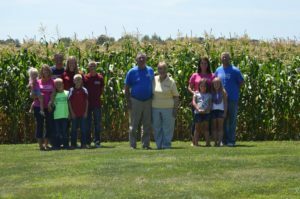 The farm has been in the Riehle family since 1910 and is currently managed by Eric and Lisa Riehle, with help from his father Mark. Eric’s brother Chris helps with the planting and harvesting each year and two of Eric and Lisa’s five children help occasionally, too. 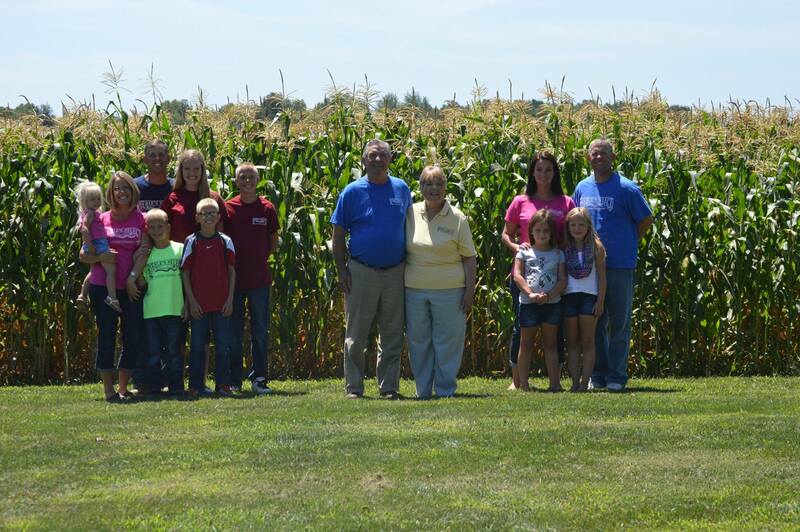 The Riehle’s started growing popcorn about 20 years ago when Eric agreed to grow 15 acres for a popcorn grower. The crop was successful, and he decided to expand his own popcorn operation.Today, in addition to the 200 acres of popcorn, the Riehle’s also raise soybeans. They are very active in their local community and have been known to make and deliver popcorn to their children’s classroom. On the day I visited, I was shown around by Donna Kunkel and Tony Hountz. Both were very knowledgeable about the inner workings of the popcorn business. Donna works in the office during the week, keeping up with orders and helping ensure the website orders are processed. Although you can order and pick up directly from the farm, they do not have regular retail store hours. If you give them a call (812-212-2202) or email them as info@selectpopcorn.com they will be happy to set up a time to pick up your order. They do have a bustling online store where you can place your orders and have your popcorn delivered right to your door. I visited after Cyber Monday and they were busy packing boxes and boxes of popcorn to ship out. Currently, Riehle’s Select Popping Corn is available locally at the George’s Pharmacy locations, along with Dotty’s/Kates Bulk Foods in Batesville; Hair Unlimited in Sunman carries their microwave popcorn; Gooseberry Flower and Gift Shop in Versailles carries a variety of Riehle’s Select Popping Corn, oils, seasonings, as well as the Whirley Pop Popcorn Poppers. I just missed the harvest this year, but there was still much to do. Pop up some popcorn and watch us work! Once the corn is picked and shelled, the kernels are then put into grain bins. When a specific variety is needed, an air system moves the corn from the bins to the cleaning and sorting system. The best popcorn kernels are selected, packaged, sealed, and prepared for shipment. The underground air system was installed a few years ago. Prior to that, the popcorn was put in large totes and transported from the bins to the cleaning and sorting area. The underground air system ensures that the corn stays out of the weather and allows for faster movement from the bins. This system cleans and sorts the popcorn by size. According to Tony things have changed in the eight years he’s been with the Riehle’s. For instance, the process to separate a 2000 pound tote of popcorn by color used to take several hours – now it takes just 15 minutes thanks to new equipment. Also, moving the corn from the bins directly to the sorter by air through underground pipes eliminates the extra labor of loading and unloading and is easier on the popcorn. After the popcorn is harvested, Tony works to package the popcorn and get it ready to ship out. Packaging for retail ranges from 4 oz. bags to 15 oz. bottles to 30 oz. bags. They supply 50 pound bags up to 2000 pound totes to a select wholesale market. They also package their gourmet popcorn for several private labels. Of course, the question they are often asked is – after working with it all the time, do you still eat popcorn? They say they still enjoy it all the time. They even have a commercial corn popper in the break area. Some of the sorted corn is loaded into totes for wholesale orders. All Riehle’s popcorn is raised NON-GMO. They offer thirteen varieties of great tasting popcorn including four varieties of tender, virtually hulless, very small kernel corns – Baby White, Baby Yellow, Baby Blue and Autumn Blaze. They also offer medium sized kernel corns – Shaman Blue, Ruby Red, Midnight Red, Pink Blossom and Pearl White; the larger kernel corns – Sunburst, Goldenrod and Organic Yellow; and Rainbow Delight which is a special blend of all thirteen. Popcorn is great for snacking and I’ve thoroughly enjoyed popping and trying several different varieties. I’m still trying to decide which is my favorite, but again, I LOVE popcorn, so I’m up for the task! The good folks at Riehle’s were very friendly and I appreciate the time they spent with me. 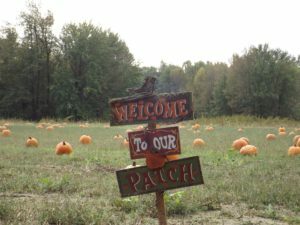 If you are looking for an outing for a scout troop, you might consider a trip to the popcorn farm. For more, check out Riehles Facebook page. I decided to drive more of the bike trail and was pleasantly surprised to find not one, but three special bridges along the route. I started out at the Welcome Center in Versailles, crossing US 50 and taking a right on Perry Street. Continuing on Perry Street, I came upon the Busching Covered Bridge which lets out near the entrance to the Versailles State Park. It’s a beautiful, well maintained bridge with easy access off US 50 just as you enter the park making it a favorite of photographers. The bridge was built in 1885 by Thomas A. Hardman and spans Laughery Creek on CR 40 South. 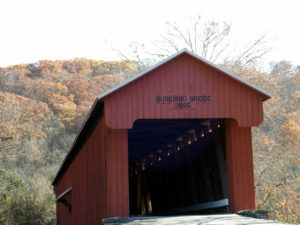 The design is a covered Howe through truss. The 182 foot all w ooden structure is open to one-lane traffic. I took a right as I exited the bridge and found myself back at US 50. I turned left to cross the highway and immediately took Cave Hill Road south. The bike trail takes you through a lot of interesting places along the way. I found the Blair Family Cemetery which was established in 1838. There were a number of well-kept farms, gorgeous views, and I really enjoyed seeing several horses in the fields that day. The next bridge I came across was a concrete arch bridge. The 202 foot, two-span concrete arch bridge over Laughery Creek on Cave Hill Road was built around 1910. It’s a closed-spandrel arch design and is open to one-lane traffic. Crossing over it, you may not realize it’s a stone arch bridge. Taking advantage of a pull-off after crossing the bridge, I took a few photos. A writer friend of mine once told me that there is a big difference between viewing a bridge from the top and viewing it from the water. I would have to agree with him on that. A short time later, I slowed down for a bend in the road and noticed a sign on an old building which read, “Locust Grove School House 1904-1925.” I wondered how many people had passed the one-room school house and had no idea it was there. Continuing on, I found a 174.8 foot steel bridge. This 9-panel, riveted Parker through truss bridge was built around 1920 and is also open to one-lane traffic and spans Laughery Creek. I found a great site that had a link to a youtube video of the bridge. The three bridges have things in common, but they are all very different. I would speculate that when Thomas A. Hardman built Busching Bridge, wooden covered bridges were the most economical way to build. The concrete arch bridge offered advantages that the earlier wooden bridges didn’t such as durability and added strength. Ten years later, when the Parker through truss bridge was built, steel may have been an easier and more economical way to build. Today’s bridges are built with a combination of steel and concrete, some are short and some are long, but they all play an important part of our transportation system. The Ripley County Tourism office is located at the Welcome Center in Versailles. 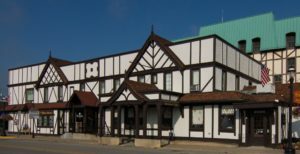 We share the building with Ripley County Economic Development, the Ripley County Chamber, and The Gooseberry Flower & Gift Shop. The ladies at Gooseberry have been decorating the shop and windows for their holiday open house for Small Business Saturday. I’m amazed at how they can transform a room — especially when they add beautiful flowers. I enjoy looking at pretty things so I’m doubly blessed by being able to visit the store every day. 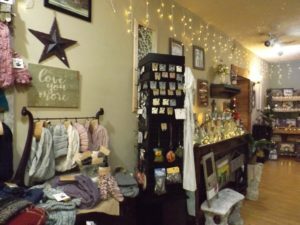 They have so many neat items — jewelry, hats and scarves, pocket trinkets, homemade soaps, candles, home décor, and figurines. I fell in love with a little bird figurine which now resides by my computer. It’s just a small thing, but there’s something about it that makes me smile each time I look at it – anytime I can add joy to my life, I’m all for it. We have so many wonderful little shops in Ripley County and Small Business Saturday — November 25th — is a great time to shop local and support them. Just think of the time, stress, and energy you could save by not traveling to a big box store or mall this year. When shopping local, parking isn’t usually a problem. Also, the sales staff are usually friends and neighbors and will go out of their way to help you have a great experience. If you need help finding the perfect item, many of the shops will place custom orders for you. I’m still uncovering some hidden gems like Monica’s Boutique. It just opened in May of 2017 and is located on US 50 across the highway from Thompson’s Outdoor Power (I guess you could consider Thompson’s an outdoor boutique). Monica’s is open Thursday and Friday from 12-6; and some Saturdays. She’s more than happy to open by appointment if you’d like to get a few friends together for a special time. The boutique offers ladies fashions and specialty t’s in sizes small to 3X. She also has a selection of cute signs, pictures, candles, and other gift items sure to please someone on your list. Owner Monica Siders is ready to help you find that perfect gift. trendy and unique ever-changing styles. We want you to leave our store with a touched heart, an uplifted soul, and the encouragement to follow your dreams.” They have a wide array of clothing in sizes XS to 3XL, jewelry, scarves, books, and gift items to choose from. Lori was busy preparing for their holiday open house November 17th and 18th. Store hours are Tuesday –Thursday 10:30-6; Friday 10:30-5; and Saturday 10-3. Another shop I’ve recently found is Cotton Blossoms Children’s Clothing Boutique located at 306 South Main Street in Versailles. They just opened in June. According to owner Katherine Conover, they have boutique children’s clothing for boys and girls from newborn to 16 years. They are open Saturday 10-5 and Sunday 12-4 and by appointment. One other unique thing they offer is handmade doll clothing for 18” dolls (think American Girls). This gorgeous park is easily accessible from the road. It doesn’t seem possible that it’s already November. The weather is turning cooler and it’s been pretty rainy in Ripley County. One overcast day I took the opportunity to drive part of the “Bike Southeast Indiana” bike trail. I am working with Dearborn, Decatur, and Jennings Counties Tourism Bureaus to update our joint bike brochure/map for next year and thought it would be a good idea to see what the trail had to offer. Exploring the trail gives me a better understanding of what it’s like so I am better equipped to explain it to someone else. For this leg of the tour, I began in Batesville and drove south on Highway 129 to Delaware; went east on Highway 350; traveled south on Highway 421 in Osgood to County Road (CR) 300 N. I traveled west for less than a mile when I came upon a gorgeous area with lakes and paved walking trails on either side of the road. Th e lakes were formed from rock quarry ponds. 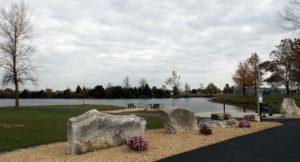 Park benches, outdoor exercise equipment, picnic tables, and a fishing area are all part of Osgood Trails (1820 W County Road 300 N, Osgood, Indiana). The trails are open dawn to dusk each day and even allow grilling in designated areas. What a great place to relax and take in nature’s beauty. 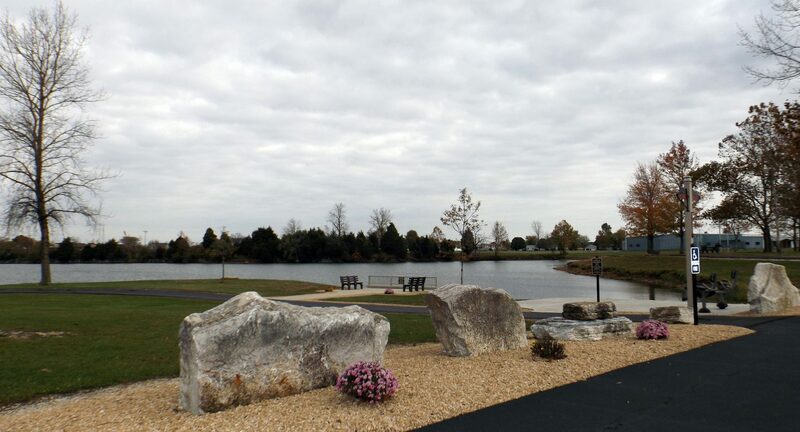 The trail is open to walkers, bicyclists, and pets on a leash and is handicap accessible. the stone that the quarry produced. Bilby Loop will take you past Bilby Tower. Surveyors Historical Society erected the historic Bilby Tower at the park. Osgood is the hometown of Jasper Bilby, who invented the innovative survey tower in 1927. I was just getting back into my car when I caught a glimpse of an eagle – thus the trail moniker Eagle View. It was a breathtaking sight. I watched as the eagle swooped down to the water and flew away. Unfortunately, I had put my camera away. I was able to locate a photo posted on the Osgood Trails Facebook page. So back in the car, I continued to Tanglewood Road where I turned south; then east on W Hopewell Road for a short jog south on CR 175 (which crossed US Highway 50); from CR 175, I traveled east on W Tanglewood Road, which turns into S Tanglewood Road and back to my office in Versailles. I’ll check out more of the bike trail another day. Along the way, I’ll share more interesting places and faces I find. I enjoy driving throughout the county when the leaves are changing. This time of year, I like to get out of the office for a few hours and enjoy the beautiful fall colors. Last week I had the opportunity while attending meetings I had scheduled in Batesville. The leaves were gorgeous on my drive up Highway 129. Next year is Ripley County’s Bicentennial and the committee is working on several projects to showcase what our county has to offer. I met with Amy Streator, Executive Director of the Ripley County Community Foundation to discuss a video project we are working on with the RCCF. Amy and I had a chance to catch up on a few other projects as we enjoyed lunch at The Sherman. The German-influenced menu offers lunch specials and favorites like the Batesville Lunch Burger –a 1/3 lb. ground short rib burger, Schnitzel Sandwich on a pretzel bun, and a Rueben on marble rye. Owners George and Peyton Hughes have completed the renovations on the 22 hotel rooms at the inn just in time for leaf peepers and holiday activities. They opened a biergarten in September which hosts live music on the weekends. Opening weekend they were fortunate to have a group of 14 musicians from Ruderatshofen, Germany perform. They played at Cincinnati’s Octoberfest the next evening. Later, I met the Ripley County Tourism Board of Directors at the Comfort Inn for a tour. In the last year, the new owners have totally renovated the hotel adding new premium bedding and replacing the carpet, fixtures, furnishings, and even the parking lot! The indoor pool has been resurfaced and a wall mural was painted by local artist Sara Bettis in the pool area. The board was impressed with the changes and congratulated owner Monte Patel and manager Samantha Young on an impressive remodel. Mr. Patel also shared the news that Comfort Inn would be changing to Quality Inn — the name change became official November 1st. While in Batesville, I met with Anna Ibold and Patricia Hatcher of the Batesville Chamber of Commerce to share ideas and get feedback for the Ripley County Bicentennial. Both were very helpful and willing to share knowledge and insights into past events and upcoming activities. I am looking forward to working with them on upcoming projects for the bicentennial and beyond. I look forward to getting out and about in the next few weeks to check out more places to go and things to do in the county. It’s hard to believe we are almost to the end of October! 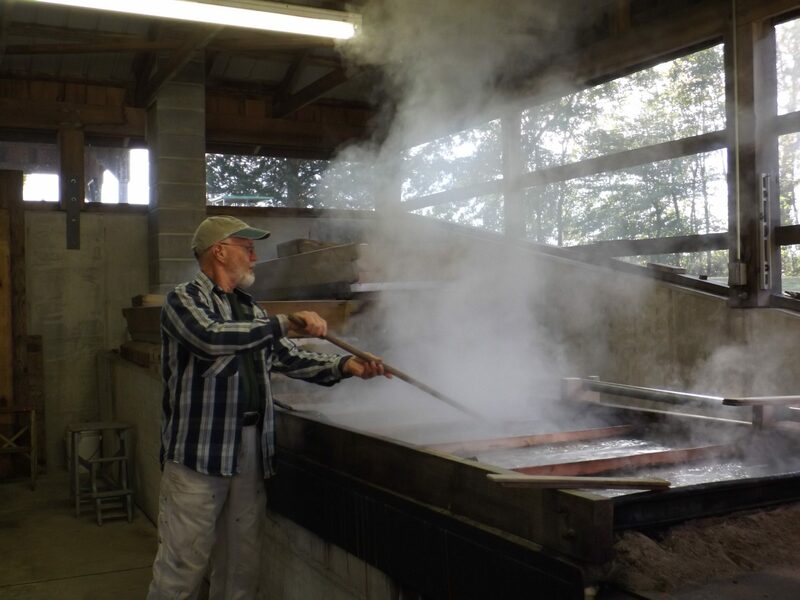 This past week I had the chance to visit a local farm and see how sorghum syrup is made. Who knew we had a sorghum mill in Ripley County? Fallen Timbers Sorghum Farm is located on Highway 129 in Milan. This is a fourth-generation family operation. 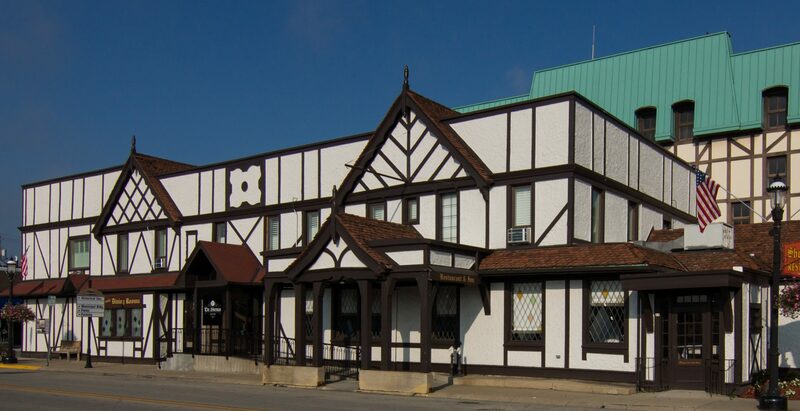 The mill was originally built in 1890 by Dr. Larry Barlow’s uncle’s grandfather near Farmers Retreat in Dearborn County. He has since moved it to his farm in Milan where he processes the sweet sorghum as they did in 1890. The sorghum is evaporated over a wood fired furnace in a copper evaporator built around 1900. Cooking over the wood fire gives the sorghum a dark brown color. In the summer, you can see the sorghum growing in patches near the road. The day of my visit, the sorghum had all been cut and was loaded on wagons ready to be pressed. Larry told me the cooking process usually takes about 5 days once he starts. This year he only had enough sorghum cane to run for three days. His crop didn’t do as well due to the rain we had earlier this year which stunted the sorghum plants. He usually runs with a crew of at least four. The day I visited he had five helpers including a dentist friend who stop by for a visit and decided to help with the run because he was enjoying it so much. Most of the people helping this year do it every year because they enjoy the experience. It takes at least two to run the press (but three is better); another person needs to keep an eye on the bubbling sorghum passing through the various stations. Dr. Barlow takes care of keeping the wood furnaces fired and stoked. As the water evaporates, the minerals and impurities float to the top and are removed along the way. The sugar content increases until it reaches about 75 percent. Larry explains the cooking process to visitors. At that point, the syrup runs through a pipe into a fine mesh screen which removes any remaining sediment as it empties into a container. The syrup is then poured into the final cooking station. The final stage has to be a controlled steady low and slow heat. After cooking the sorghum syrup to the proper consistency, it is put into jars where it continues to cook until it cools — the same as it was done in 1890. I enjoyed my visit to the sorghum mill. Check back next week to see what other treasures I’ve found. Hello everyone, my name is Terri Trowbridge and I am the new Executive Director for Ripley County Tourism. Katherine Taul previously held the position until she retired after 16 years of service on September 1st, 2017. It’s hard to believe it’s already been a month! It’s funny how you can live somewhere for 34 years and not know about some of the things that make your county special. When you have a full time job and family to keep you busy, it can happen pretty easily. I drove much the same way to and from work for the last 21 years in my previous job as Director of Publications for the National Muzzle Loading Rifle Association in Friendship. When you drive the backroads straight to work each day you can miss a lot. But… things have changed in my life, and now I have a whole county I need to get reacquainted with. It’s hard to live in Ripley County and not know about the Pumpkin Show. I’ve been attending the Pumpkin Show and the parade on Saturday morning for years. I’ve rode the rides, pulled ducks from the duck pond, admired the artwork of local artists on display inside the courthouse, bought countless raffle tickets supporting local clubs, eaten cotton candy and of course, elephant ears, and admired the big pumpkins at the end of the parade. However, this is the first year that I’ve actually witnessed the pumpkin weigh-in. As the hoist lifted the straps, the rope closed in under the pumpkin and allowed it to be raised in the air. It takes place at the main stage at the end of the parade. Everything moved along rather quickly considering that some of the pumpkins weighed over 500 pounds! 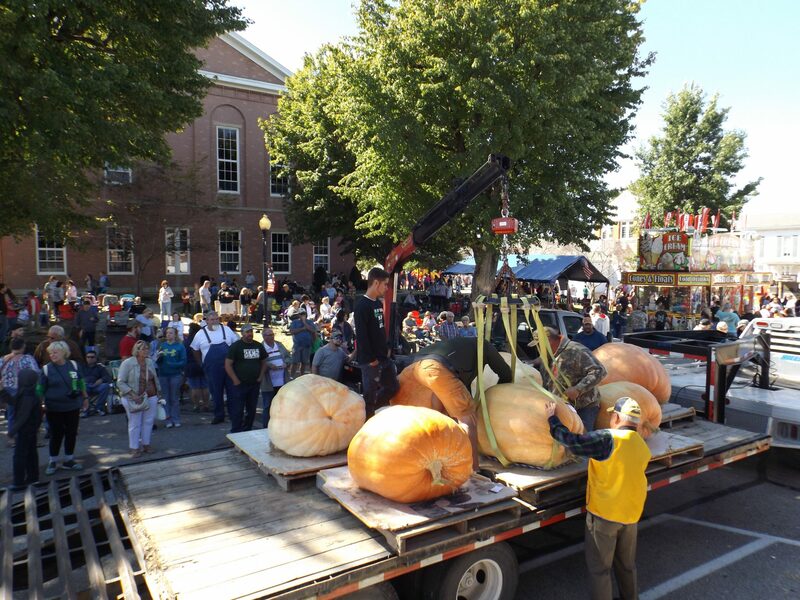 A crane hoist on a truck was placed in front of the stage and the pumpkins were brought on a trailer or truck bed to the hoist. This year’s winning open class pumpkin was grown by Darrell Franklin of Holton, IN and weighed in at 692 pounds! ss pumpkin was grown by Darrell Franklin of Holton, IN and weighed in at 692 pounds! It didn’t break the record, but Linus would have been proud of this great pumpkin! I’m going to do my best to get to know the county better over the course of the next year and I’d love it if you want to come along. Look for a new post from me each week telling you about what I’ve discovered.